The video showing a clash between two groups is from Gujarat’s Morbi town, and took place on 8 December. Police had ruled out any communal angle. 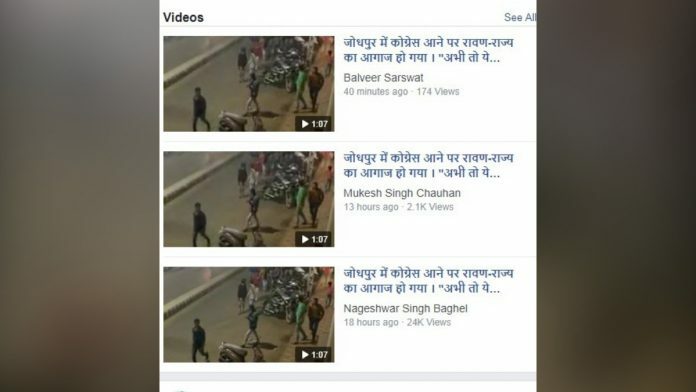 New Delhi: A video with a misleading caption that a riot broke out in Rajasthan’s Jodhpur after Congress’ victory in the assembly elections has been widely shared on social media. The Congress has won 99 out of 199 seats in Rajasthan and is set to form government in the state after five years. The video shows a group of men running on the street after being chased by another group of people with sticks in their hands. The video has been shared with a caption saying that Hindus are being persecuted by Congress supporters after the party’s victory Tuesday. However, the video in question was not shot in Rajasthan. It was made on 8 December, before the elections results were declared. What it actually shows is a clash between two local gangs in Morbi town of Gujarat. According to the Gujarat police, there was no communal overtone in the fight between the two groups. The same video was shown on ABP Asmita TV channel on 9 December. Zee 24 Kalak channel also covered the incident, showing the same scenario depicted in the video but from a different angle. The video has already been shared more than 1,000 times on social media platforms such as Facebook and Twitter, and is being forwarded on Whatsapp in a bid to whip up communal frenzy.